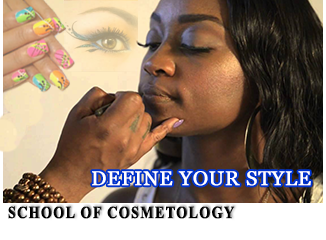 The School of Aesthetics and Cosmetology was established in 1991 as a premier training institution for Beauty Services education and training. Our students are empowered to develop integrity, perform creatively and enter the Beauty Services industry as leaders. Excellent performance is honed by Lecturers holding over 100 years of combined industry experience. Cosmetology is a booming industry locally and internationally. In order to meet the growing demand for skilled professionals in this field, Excelsior Community College has developed the Associate of Science Degree in Cosmetology. This programme has been designed to ensure that the persons who choose careers in the field of cosmetology receive training at the highest level possible. Our graduates will be professionals who meet international standards in the beauty care industry. The content of the course is current and relevant and gives the guarantee that our graduates are able to function effectively in the world of work and/or matriculate into higher degree programmes that are offered by institutions across the Caribbean, the Americas and Europe. Makeup artists for television and motion pictures, Skin Care Specialists, Cosmetics Sales Executives, Cosmetology industry educators, Manicurists and nail art technicians and Salon owners. Four (4) subjects including English Language and Level II certificate in Cosmetology from HEART or Diploma from City and Guilds. Special consideration should be given to mature students over 25 years old who have five ( 5 ) years working experience in the industry. The Applied Associate of Science degree prepares graduates for careers in spa and health and wellness management. The program is designed to prepare students with an industry-specific business foundation combined with an overview of healthful living courses with specific application to spa and health and wellness management. Graduates can be at the forefront of the movement of collaborative and integrative health care. Opportunities may exist in newly emerging preventative health services in corporate wellness centers, college health services, insurance agencies, and pharmaceutical companies. 1. Pass five (5) subjects in GCE O' Level/ CXC/CSEC including English and Mathematics, a technical subject and any two (2) other appropriate subjects, with grades A, B or C.
2. Pass three (3) subjects in GCE O' Level/ CXC/CSEC including English and Mathematics, along with a Level Two (2) NCTVET or City & Guilds certification in a technical subject. Grade III passes must have been obtained after September 1998. Applicants in this category must be over the age of twenty five (25), with a minimum of five (5) years experience in a specialized area of the industry, for e.g. hospitality and tourism, practical nursing, spa therapy. Applicants will be accepted based on his/her employment portfolio, as well as certificates of achievement, positions held along with job descriptions and community involvement. Each applicant will be assessed independently of each other. Please refer to Prior Learning Manual for additional information. General Cosmetology provides the student with a general introduction to the beauty services industry. This comprehensive programme offers fundamental concepts relating to hair styling, nail care. The core content areas are supplemented with courses in Entrepreneurship, Communication, and Calculation. This cosmetology level two (2) programme is instrumental in establishing a successful career in the beauty services industry. Students are exposed to knowledge and skills such as advanced hair cutting, styling and braiding, makeup artistry, skin care and nail technology. These programmes are comprehensive and intense as they cater to motivated individuals with a strong desire to acquire specific skills in the beauty services industry.